Vision screening is the evaluation of your child's eyes and vision during routine visits to eye healthcare professionals, even though there may not be any visual problem. The aim of screening is to pick up any possible sight-threatening disease and to limit the impact of established eye disease in children. Vision problems during childhood can impact significantly on the mental, emotional and social development of any child. Severe visual problems may also be related to learning impairment and chronic disease. One important condition that screening aims to detect early is amblyopia. Amblyopia or lazy eye is the reduction in vision in an eye that has not been adequately used during childhood, resulting in underdevelopment of the visual pathways for that eye. The eye is usually physically normal without any sign of any organic disease. Amblyopia is reasonably common and occurs in around 2% of children. Amblyopia monitoring therefore allows for early detection and patching treatment for the best visual outcomes. However, the visual system continues to develop and mature until about the age of 8 years. Beyond 8 years, the visual system is fully developed and the connections and nerve pathways are no longer able to change or improve. Anything that disrupts this development process will cause impaired vision. Your child's first 8 years of life is therefore very critical for good vision. If your child is at higher risk of eye disease, then vision screening and amblyopia monitoring should be conducted more regularly. Your local ophthalmologist will be able to advise on an appropriate screening interval for your child. Reasons for higher risk include maternal pregnancy problems, premature birth, low birth weight, developmental delay and family history of eye disorders. The left eye shows a normal red reflex, which is the reflection of the red color from the back of the eye. In the right eye, there is no red reflex. Instead, the pupil is yellow in color. This can be due to various reasons including cataract and retinoblastoma. Measuring the vision can be difficult, particularly in younger children. In babies, this can be estimated by observing how well each eye fixes and follows a particular object. In toddlers, this can be estimated by observing how well they reach for tiny colored sweets. In pre-school children, vision can be determined by matching shapes and/or alphabets. Letter matching with the Sheridan Gardiner test is considered to be the most useful formal vision test in children aged 4 and above. 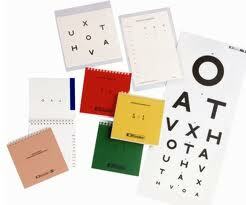 The Sheridan-Gardiner test is similar to visual acuity testing with the Snellen chart. The child is shown alphabets of different sizes through a set of cards 6 meters away. The child then identifies the alphabet by pointing to the same alphabet in the identification card that has been provided to him or her. The child therefore does not need to know the alphabet to perform this test. Testing is done one eye at a time with glasses on. 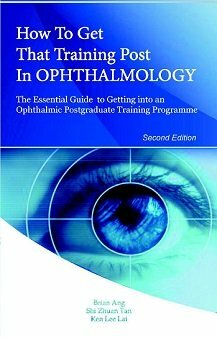 - Ophthalmologists are medical doctors who have graduated from medical school and have undergone residency or registrar training in ophthalmology. They can diagnose and treat eye diseases, prescribe medications and spectacles, and perform surgery. - Pediatric ophthalmologists are ophthalmologists who have undergone additional fellowship training in the medical and surgical treatment of eye diseses in children. - Optometrists are not medical doctors but doctors of optometry. They are specialists in the diagnosis and treatment of refractive error, such as myopia, hyperopia and astigmatism, with spectacles and contact lenses. They may also prescribe some medications but cannot perform surgery. - Opticians make, fit and dispense spectacles lenses and frames. They are usually based in the community. - Orthoptists are specialists in the diagnosis and treatment of eye movement and childhood vision problems. They are usually based in the hospital setting. - Clinical nurse specialist are nurses who have significant experience in managing eye diseases alongside ophthalmologists. If you are in any way unsure or concerned, please consult your ophthalmologist for further assessment. Early diagnosis and early treatment of eye problems often gives the best visual outcomes.